Patrick Faalafua is a self-taught mixed-media artist who combines ancestral tribal tattooing and urban graffiti with non-traditional mediums to create one-of-a-kind pieces of art. 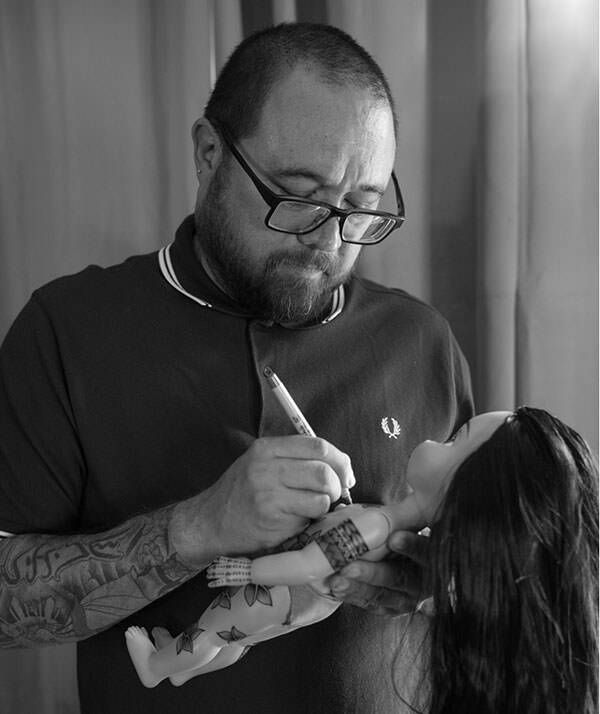 Influenced by his Polynesian roots of honoring family and respecting culture within the realm of tribal tattooing, he applies his vision to unconventional canvases such as dolls and figures. Faalafua grew up in the South Bay area of Los Angeles raised by a Filippino mother and Samoan father. His love for all things Disney started at a young age and continues to this day. His earliest artistic endeavor was as a cartoonist for his high schoolnewspaper, but his political and social statements did not go over well with school administrators. A foray into graffiti art ended with a suspension from school and learning experience at home. Influenced by graffiti artists such as Slick Tempt, Seen and Risk, as well as tattoo artists like Horiyoshi III, Oliver Peck and Chris Nunez, Faalafua sought to combine these different styles and apply them on a new medium. First venturing into Sticker Art, he grew a worldwide following as the artist “Sheik.” Needing a new artistic challenge he continued to experiment with other media. Faalafua found his calling while collecting vintage Kewpie dolls. He envisioned applying the storytelling art of Japanese full-body tattoos to this new canvas. He found the texture and material used to produce the original Kewpie dolls offers an excellent canvas to accept the ink. By a unique blending of Sharpie colors and his unorthodox creative process, a series of Kewpie Doll Yakuzas were brought to life. The response was immediate and this collection was immediately purchased by a Japanese art collector and displayed overseas. Soon Faalafuawas being commissioned to create one-off personalized dolls for private collectors. Faalafua discovered that Disney Princess dolls offered similar canvas opportunities as the original Kewpie dolls and this allowed him the opportunity to retell the stories of these characters in tribal tattoos, thus opening the door to his newest collection. Each doll takes approximately two weeks to complete with his painstaking attention to detail.